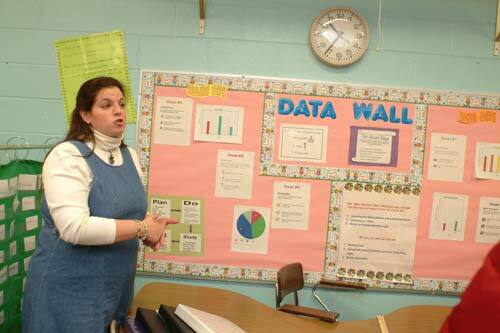 What are Classroom Data Centers? Why are Data Centers Important? How are Data Centers Developed? 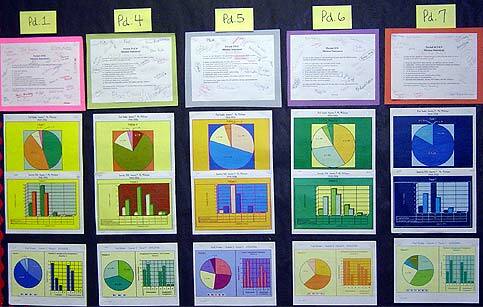 The focal point of a Baldrige-guided classroom is the classroom data center. It commands center stage and communicates a classroom environment focused on evidence of student learning. "My Job, Your Job, Our Job"
Data centers become a reference for students to organize and maintain their attention on results. A classroom in which each student understands the expectations based on explicit, measurable goals/objectives with data charts and quality tools to keep the class on track is critical to attaining results. Once the classroom teacher and students have built a classroom culture of trust and open communication focused on improving teaching and learning, the class establishes a data center. The classroom data center must be created within an environment in which trust has been established among all members of the class. For more information regarding building a classroom learning system, see the handbook for teachers, My Job, Your Job, Our Job: Building a Classroom Learning System, available to MCPS staff members through Dr. Michael Perich, Coordinator, Systemwide Continuous Improvement. For others, the document may be purchsed through Dr. Perich. There is a fee of $15.00 plus shipping and handling.